Previous Sit Reps available here. EAG's Open Play schedule has been updated for 2016. The indoor field is located at 15 Corning Street in Lock Haven, PA 17745. Entrance at rear of the building is shared with LHSC, so please come in through the door that says Lock Haven Strength and Conditioning. Participants are in-processed between 1200 and 1300. Right now we are just using the first floor so the play area is pretty tight and makes for some intense action. 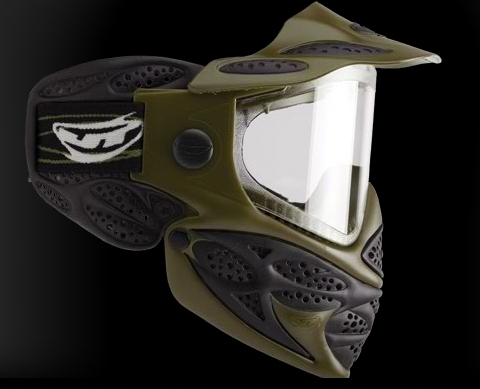 Accordingly, the field velocity limit is 310 FPS with .25 gram BBs and Goggles/Facemasks with plastic or mesh face and ear protection are required. Approved barrel blocking devices are required. We have a limited number available. There is limited heat in the building, so please dress warmly. That's pretty much it. Please let us know if you have any questions or concerns. We hope to see you soon! A few pictures can be seen here. EAG's Open Play schedule has been updated for 2015. We would like to take this opportunity to thank you all for your continued support of EAG Combat Simulations. Unfortunately, due to the rising cost of doing business and in spite of our best efforts to avoid any pricing increases for the past 7 years, we are forced to raise our field fee by $5.00 and our EAG Package price by $10.00. All other prices will remain the same. These price increases are effective as of today, 12 January 2014. On the more positive side, we have eliminated the Bring Your Own Biodegradable BBs fee. BBs used on the field still must be environmentally friendly and customers who rent weapons still may not BYOBBBs. John Campbell was awarded the Battle Honor Corps Warrior of the Year 2013 by The Battle Honor Corps Command, EAG Combat Simulations on 12 January, 2014 in recognition of outstanding attendance/achievement during combat operations resulting in the highest year end total battle honor average. EAG's Open Play schedule has been updated for 2014. After almost eight years of hard use, our Beita-Spetsnaz AK rental fleet has finally been retired. 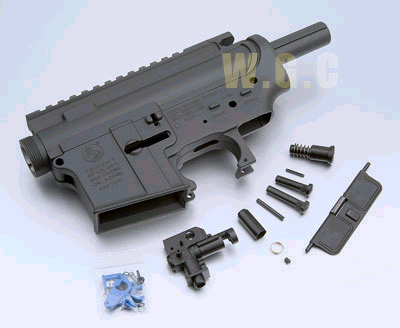 Taking their place - ten (10) brand new G&G TR16 Carbine Light. We'd like to thank all of our rental customers for their patience and support and invite them back to try the new weaponry! We are now offering for sale ten (10) Tokyo Mauri Beita-Spetsnaz AK, two (2) new RWL Stag Daniel Defense M4 Socom (Limited Edition), and one (1) used Tokyo Marui G3 SG1. We're asking between $100-$225 per piece depending on condition. Used mini batteries are also available for $10 each and used high cap mags are available for $20 each. Please let us know if you're interested. WHO: Individuals/groups interested in participating in a Military Combat Simulation. Attendees must be at least 13 years of age. WHAT: Outpost - Daybreak will be a Military Combat Simulation occurring over the course of one day. Saturday, 22 June, 2013, 8:00 a.m. to 9:00 p.m.
Saturday, 27 July, 2013, 8:00 a.m. to 9:00 p.m.
Saturday, 24 August, 2013, 8:00 a.m. to 9:00 p.m.
Click http://www.eaghq.com/OPDBSIMULATION.html to visit the Official Outpost - Daybreak Force Briefing Website, where you will find the latest and most accurate information concerning the simulation. WHO: Individuals/groups interested in participating in a Military Combat Simulation. Attendees must be at least 18 years of age. WHAT: Outpost will be a 4 hour Military Combat Simulation occurring over the course of one night. Click http://www.eaghq.com/OP13SIMULATION.html to visit the Official Outpost Force Briefing Website, where you will find the latest and most accurate information concerning the simulation. Gabriel Pursel was awarded the Battle Honor Corps Warrior of the Year 2012 by The Battle Honor Corps Command, EAG Combat Simulations on 13 January, 2013 in recognition of outstanding attendance/achievement during combat operations resulting in the highest year end total battle honor average. EAG's Open Play schedule has been updated for 2013. Scott Long was awarded the Battle Honor Corps Warrior of the Year 2011 by The Battle Honor Corps Command, EAG Combat Simulations on 08 January, 2012 in recognition of outstanding attendance/achievement during combat operations resulting in the highest year end total battle honor average. EAG's Open Play schedule has been updated for 2012. WHAT: Operation: Bolt Cutter will be a 6 hour Military Combat Simulation occurring over the course of one day. Click http://www.eaghq.com/OPBCSIMULATION.htm to visit the Official Operation: Bolt Cutter Force Briefing Website, where you will find the latest and most accurate information concerning the simulation. Click http://www.eaghq.com/OP12SIMULATION.htm to visit the Official Outpost Force Briefing Website, where you will find the latest and most accurate information concerning the simulation. WHO: Individuals/groups who desire a more intelligent, challenging and realistic level of participation and interaction than the standard Airsoft event provides. Participants must be positive, motivated and objective oriented. Participants must be at least 13 years of age. Click http://www.eaghq.com/NS12SIMULATION.htm to visit the Official Natural Selection 2012 Force Briefing Website, where you will find the latest and most accurate information concerning the simulation. NATURAL SELECTION 2011 will be an 8 hour Military Combat Simulation occurring over the course of one day, offered 27 AUGUST 2011. Click on the banner to visit the Official Natural Selection 2011 Element Briefing Website, where you will find the latest and most accurate information concerning the simulation. Brian Weidler was awarded the Battle Honor Corps Warrior of the Year 2010 by The Battle Honor Corps Command, EAG Combat Simulations on January 2nd, 2010 in recognition of outstanding attendance/achievement during combat operations resulting in the highest year end total battle honor average. This is Brian's second BHCWOTY. Click on the banner to visit the Official Outpost Force Briefing Website, where you will find the latest and most accurate information concerning the simulation. EAG's Open Play schedule has been updated for 2011. NATURAL SELECTION 2010 will be an 8 hour Military Combat Simulation occurring over the course of one day, offered 14 AUGUST 2010. Click on the banner to visit the Official Natural Selection 2010 Element Briefing Website, where you will find the latest and most accurate information concerning the simulation. 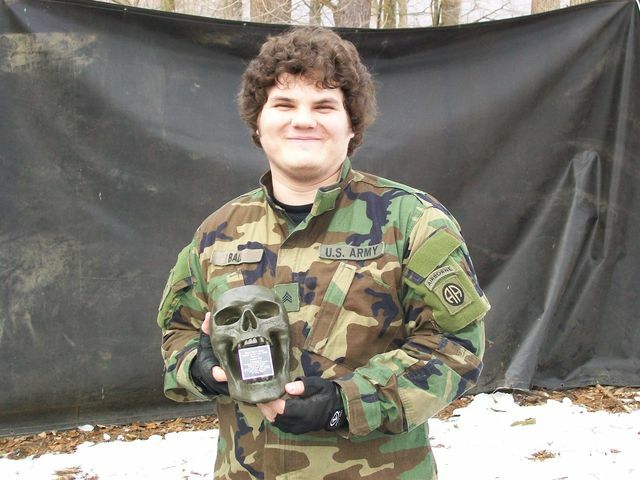 Caleb was awarded the Battle Honor Corps Warrior of the Year 2009 by The Battle Honor Corps Command, EAG Combat Simulations on January 3rd, 2010 in recognition of outstanding attendance/achievement during combat operations resulting in the highest year end total battle honor average. WHAT: JACK will be an 6-8 hour Military Combat Simulation occurring over the course of one day. Click on the banner to visit the Official JACK Force Briefing Website, where you will find the latest and most accurate information concerning the simulation. EAG's Open Play schedule has been updated for 2010. After many years of hard use, our JT Spectra Flex 7 Goggle/Facemask System rental fleet has finally been retired. Taking their place - ten (10) brand new JT Status Goggle/Facemask Systems. Status is the top-of-the-line JT goggle. Equipped with the QuickLock Lens System (QLS) for fast and easy lens change. The mask comes with a dual pane thermal lens, 270 degree of visibility and removable visor for play in all light and weather conditions. With a narrow streamlined jaw, the gel mask allows troops to sight better and be less of a target. We'd like to thank all of our rental customers for their patience and support and invite them back to try the new equipment! We are now offering for sale ten (10) JT Spectra Flex 7 Goggle/Facemask Systems formerly part of our rental fleet. We're asking $20 per system. Please let us know if you're interested. NATURAL SELECTION 2009 will be an 8 hour Military Combat Simulation occurring over the course of one day, offered 15 AUGUST 2009. Click on the banner to visit the Official Natural Selection 2009 Element Briefing Website, where you will find the latest and most accurate information concerning the simulation. WHAT: THE SIEGE will be an 6-8 hour Military Combat Simulation occurring over the course of one day. Click on the banner to visit the Official THE SIEGE Force Briefing Website, where you will find the latest and most accurate information concerning the simulation. Andrew Ball was awarded the Battle Honor Corps Warrior of the Year 2008 by The Battle Honor Corps Command, EAG Combat Simulations on January 4th, 2009 in recognition of outstanding attendance/achievement during combat operations resulting in the highest year end total battle honor average. EAG's Open Play schedule has been updated for 2009. An adjustment has been made to the Combat Simulations Rules of Engagement under the heading: IEDS & GRENADES. WHAT: Insurrection will be an 8 hour Military Combat Simulation occurring over the course of one day. WHEN: Saturday, 23 August, 2008, 8:00 a.m. to 10:00 p.m.
Click on the banner to visit the Official Insurrection Element Briefing Website, where you will find the latest and most accurate information concerning the simulation. EAG Combat Simulations warmly welcomes newly affiliated teams, 1st SOAR and MPAF, to our organization. 1st SOAR has signed on as a silver level affiliated team, MPAF as a gold level affiliated team. We are proud to have both among our ranks and look forward to operating with them. Good luck to both teams! NATURAL SELECTION 2008 will be an 8 hour Military Combat Simulation occurring over the course of one day, offered 21 JUNE 2008. Click on the banner to visit the Official Natural Selection 2008 Element Briefing Website, where you will find the latest and most accurate information concerning the simulation. Dan was awarded the Battle Honor Corps Warrior of the Year 2007 by The Battle Honor Corps Command, EAG Combat Simulations on January 6th, 2008 in recognition of outstanding attendance/achievement during combat operations resulting in the highest year end total battle honor average. We would like to take this opportunity to thank you all for your continued support of EAG Combat Simulations! We are happy to announce that the regular price of 2200 rounds of ammunition has been dropped 20% to $20.00 - watch for even better deals throughout the season. EAG Combat Simulations warmly welcomes newly affiliated Eagle Elite to our organization. Eagle Elite has signed on to be the first team to take part in our newly developed multi-tiered affiliation program. Comprised of veteran combat simulation enthusiasts, Eagle Elite has deep roots at EAG. We are proud to have them among our ranks and look forward to operating with them. Good Luck Eagle Elite! EAG Combat Simulations' Battle Honor Corps Warrior of The Year 2007 has been determined and will be announced at the first open play date of the year - 06 JAN 08. EAG's 2008 waiver and release of liability has been uploaded. An adjustment has been made to the Combat Simulations Rules of Engagement under the heading: VEHICLES. Direct Action will be an 8 hour Military Combat Simulation occurring over the course of one day, offered four times over the course of the year. Click on the banner to visit the Official Direct Action Force Briefing Website, where you will find the latest and most accurate information concerning the simulation. Adjustments have been made to the Combat Simulations Rules of Engagement. First things first - EAG's Open Play schedule has been updated for 2008. Now through December, bring someone new to open play and they get the EAG Package and 200rds free and you get 50% off all non-consumable fees. WNYAL: 23 AUG 08 - This event will be held at WNYAL's site in NY. We're working on getting the ammo you need to you at a lower price. Standby. Season Pass (26 field fees): $130 - save $130! 1/2 Season Pass (13 field fees): $97 - save $33! These passes can be used for open play and/or private rentals. Contact us for more details. Next Sunday, 28 October 2007, 10 AM to 5 PM - Extended Hours! NATURAL SELECTION 2007 will be an 8 hour Military Combat Simulation occurring over the course of one day, offered 18 AUGUST 2007. Click on the banner to visit the Official Natural Selection 2007 Element Briefing Website, where you will find the latest and most accurate information concerning the simulation. Due to the decision to allow all Non-ESOG troops to respawn during combat operations, adjustments have been made to the Combat Simulations Rules of Engagement under the heading; DYING & RESPAWN. ZERO HOUR will be an 8 hour Military Combat Simulation occurring over the course of one day, offered three times over the course of the year. Click on the banner to visit the Official Zero Hour Force Briefing Website, where you will find the latest and most accurate information concerning the simulation. Due to the recent decision to allow all Non-ESOG troops to respawn during combat operations, BHC members may no longer take possession of the BH beads of enemy dead or wounded. Brian Weidler was awarded the Battle Honor Corps Warrior of the Year 2006 by The Battle Honor Corps Command, EAG Combat Simulations on January 7th, 2007 in recognition of outstanding attendance/achievement during combat operations resulting in the highest year end total battle honor average. We would like to take this opportunity to thank you all for your continued support of EAG Combat Simulations. Unfortunately, due to the rising cost of doing business and in spite of our best efforts to avoid any pricing increases for the past 11 years, we are forced to raise our field fee by $5.00 and correspondingly our EAG Package price by $5.00. All other prices will remain the same. These price increases are effective as of today, 01 January 2007. On the more positive side, we have also decided to offer a customer loyalty program designed to reward our most faithful customers. We had originally planned to offer a graduated schedule where customers would earn a 1 percent discount for each time they attended. We decided against it when we realized that it really wouldn't provide much of a discount to the customer and also that it would require having change on hand - change is bad. Anyway, we decided to go with a simple program that provides a $10 discount for every 5 times the customer attends. We hope this program will motivate customers to come out more often and also help make it more affordable for them to do so. EAG Combat Simulations' Battle Honor Corps Warrior of The Year 2006 has been determined and will be announced at the first open play date of the year - 07 JAN 07. EAG's 2007 waiver and release of liability has been uploaded. EAG's Open Play schedule has been updated for 2007. Troops who take hits while wearing body armor should realistically simulate the effects of taking hits to body armor. Sick of bad guys camping out on the second stories of the compound? Tired of ESOG hogging all the grenades? Good news; we have secured eight (8) concussion grenade simulators for rental use. 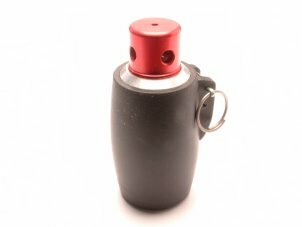 Just pull the pin and toss - the grenade will detonate within 1.5 to 3 secs after the spoon is released. Click on the photo to see one of the grenades in action. 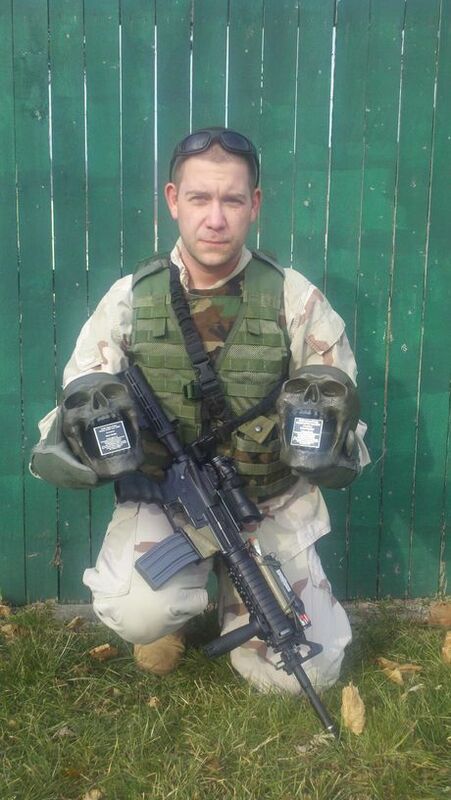 Pricing has yet to be finalized, but expect the armed grenade to be $7.00 per session and reloads to be $2-$3. NATURAL SELECTION 2006 will be an 8 hour Military Combat Simulation occurring over the course of one day, offered three times over the course of the year. Click on the banner to visit the Official Natural Selection 2006 Element Briefing Website, where you will find the latest and most accurate information concerning the simulation. It is important to understand that once a troop has used the safe word "RED" he has announced himself as compliant and he must remain compliant for the rest of the mission and/or operation. 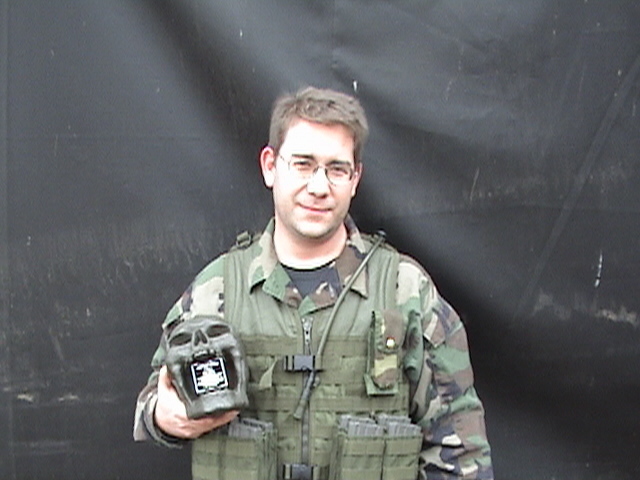 Kyle was awarded the Battle Honor Corps Warrior of the Year 2005 by The Battle Honor Corps Command, EAG Combat Simulations on January 8th, 2006 in recognition of outstanding attendance/achievement during combat operations resulting in the highest year end total battle honor average. Both treated and untreated chest wounded troops die from their wounds if they are not evacuated to the staging area before the end of the operation. BHC members can take possession of the BH beads of enemy dead or wounded. They may retain these BH beads only if their assigned objectives have been accomplished within the operational timeframe. BHC members can not take possession of BH beads of friendly dead or wounded. Dead BHC members lose half of their BH beads if they are not evacuated to the staging area before the end of the operation. Captured enemy troops are worth points when the capturing force's assigned objectives have also been accomplished. In the event of a capture, captors should deliver the POW to the staging area at the end of the operation. *BHC members can take possession of the BH beads of enemy captured. They may retain these BH beads only if their assigned objectives have been accomplished within the operational timeframe. *BHC members who lose their BH beads due to being captured will be reimbursed the amount lost by BHC Command. EAG's Open Play schedule has been updated to include dates in 2006. An explosion caused by an EAG approved improvised explosive device (IED) kills any troops within 10 feet of the detonation. An explosion caused by an EAG approved simulated concussion grenade, occurring in open terrain, kills any troops within 10 feet of the detonation. An explosion caused by an EAG approved simulated concussion grenade, occurring in closed quarters, kills any troops within the closed quarters. Hits caused by an EAG approved simulated fragmentation grenade/device kill any troops hit by fragmentation. Troops wearing replica ballistic plates modified to weigh at least the documented weight of an actual ballistic plate of similar size may ignore the corresponding number of hits to the plate that the actual ballistic plate is rated for. "Participants who use any structures such as the sniper tower, compound buildings and in-ground fighting positions, do so at their own risk.."
"Participants who use any structures such as the compound buildings and in-ground fighting positions, do so at their own risk." "No more than one soldier may occupy each of the three levels of the sniper tower at one time. Troops that do so will be warned. If this happens twice, those troops will be removed permanently from the simulation without refund." "No participants may occupy the sniper tower. Participants that do so will be removed permanently for the day without refund." "No participants may ascend or descend the sniper tower in any way other than the steps provided." "No participants may ascend or descend the compound buildings in any way other than the steps provided." The third and final presentation of Flashback, formerly scheduled for 01 October 2005, has been rescheduled for two weeks later; 15 October 2005. We hope this adjustment doesn't cause any scheduling conflicts for troops who may have been planning to attend and we apologize for any inconvenience it may cause. After almost three years of hard use, our M4A1 rental fleet has finally been retired. Taking their place - ten (10) brand new Tokyo Mauri Beita-Spetsnaz AKs, featuring a newly designed Hi-Capacity magazine that is actually shorter than the standard AK magazine. 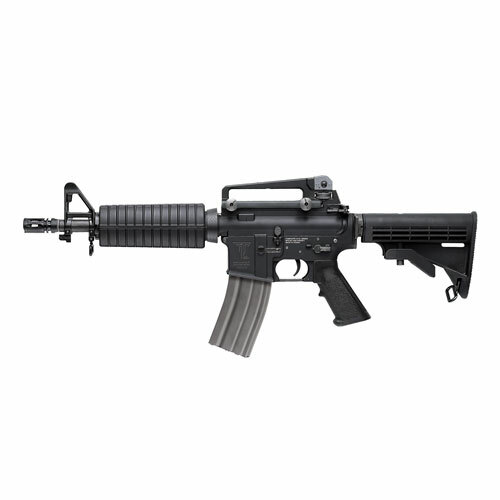 We are now offering for sale ten (10) TM M4A1s and one (1) ICS M4A1 formerly part of our rental fleet. The TM M4s were recently outfitted with G&P metal receivers, new hop up units and new stock springs and pistons in May of last year. Since the upgraded metal bodies are worth $130 alone, we're asking between $175-$200 per piece depending on condition. Used mini batteries are also available for $10 each and used high cap mags are available for $20 each. Please let us know if you're interested. FLASHBACK will be an 8 hour Military Combat Simulation occurring over the course of one day, offered three times over the course of the year. Click on the banner to visit the Official Flashback Force Briefing Website, where you will find the latest and most accurate information concerning the simulation. "All accumulated battle honor beads must be brought to the field to be eligible to use the �Ultra-Realistic Health Point System� and to be eligible to gain or lose beads as a result of that day�s activities." "Absenteeism from a year's worth of Battle Honor Corps �objective driven� exercises presented by EAG Combat Simulations is considered a resignation of membership. Exceptions may be made by Battle Honor Corps Command on a case by case basis." EAG's Open Play schedule has been updated to include dates in 2005. Our e-mail has been down (unknown to us) for a few days now - please resend any e-mails that you did not receive responses to. We apologize for the inconvenience. 12 through 17 year-olds can participate but must have an underage waiver, furnished by us, signed by parent or guardian. This form must be completed each visit even if accompanied by parent or guardian. Our waiver can be found here. Goggles/Facemasks with ear protection or balaclavas are required. We are pleased to report the third and final presentation of Mayday a complete mission success. A SPECIAL THANK YOU TO THE ATTENDEES FOR THE OUTSTANDING SUPPORT DURING THE OPERATION. Both the Army and the Militia performed above and beyond expectations. Both teams' outstanding efforts to achieve the objectives have truly proved that they have what it takes to get the job done. Our congratulations to all of them on their excellence in all endeavors. After action reviews of the 04 September 04 Presentation of Mayday are available here. Official Mayday photos are available to view here. "If an unintentional explosion occurs on the battlefield, troops within 10 feet of the detonation are considered killed." "An explosion caused by a booby trap kills any troops within 10 feet of the detonation. An explosions caused by a simulated concussion grenade, occurring in open terrain, kills any troops within 10 feet of the detonation. An explosions caused by a simulated concussion grenade, occurring in closed quarters, kills any troops within the closed quarters." We are pleased to report the second presentation of Mayday a complete mission success. A SPECIAL THANK YOU TO THE ATTENDEES AND OUR SPONSOR FOR THE OUTSTANDING SUPPORT DURING THE OPERATION. Both the Army and the Militia performed above and beyond expectations. Both teams' outstanding efforts to achieve the objectives have truly proved that they have what it takes to get the job done. Our congratulations to all of them on their excellence in all endeavors. After action reviews of the 10 July 04 Presentation of Mayday are available here. VHS copies of the unedited video footage shot during the operation are available for $16.00 (delivery included). Troops planning to attend the second or third presentation of Mayday may find these photos and video an indispensable source of intelligence. For more information, go here. The Intelligence area of the HQ has been updated to include imagery intelligence of the crash site located within the AO. After over two years of hard use, our rental fleet has finally gotten a much needed renovation. The zip-tied plastic receivers have been replaced with G&P metal receivers, new hop up units have been installed and each gearbox has been outfitted with a brand new stock spring and piston. We'd like to thank all of our rental customers for their patience and support and invite them back to try the new weaponry! EAG Combat Simulations July presentation of Mayday is to be held Saturday, 10 July rather than 11 July as the banner reads. If this causes any inconveniences please contact us. We are pleased to report the first presentation of Mayday a complete mission success. A SPECIAL THANK YOU TO THE ATTENDEES AND OUR SPONSORS FOR THE OUTSTANDING SUPPORT DURING THE OPERATION. Both the Army and the Militia performed above and beyond expectations. Both teams' outstanding efforts to achieve the objectives have truly proved that they have what it takes to get the job done. Our congratulations to all of them on their excellence in all endeavors. After action reviews of the 01 May 04 Presentation of Mayday are available here. EAG's Credit for Academic Achievement Program, which provided field credit to students for A letter grades, has been discontinued due to abuse of the program. Regrettably, the program did not produce the intended result. Its unfortunate how the actions of a few can ruin things for everyone else. MAYDAY will be an 8 hour Military Combat Simulation occurring over the course of one day, offered three times over the course of the year. Click on the banner to visit the Official Mayday Force Briefing Website, where you will find the latest and most accurate information concerning the simulation. 22-01-04 12:00 -- The EAG Combat Simulations Website is Now LIVE!! Welcome to EAGHQ.com, EAG Combat Simulations' Headquarters on the Internet. Here you will find the latest and most accurate information regarding EAG operations. Be certain to check back often as we will continually make new information available.